What are deal-breakers for you in relationships? Wasn't this a similar question to when you asked about anchovies on your pizza? I think you find your deal-breakers as you go along. If you have a list of them you might be cutting yourself off from getting to know someone great because of perceived deal-breakers. That being said, I don't know that I have deal-breakers (aside from not being able to give full body hugs) so much as red flags. Red flags: Unwillingness to work, dishonesty, and inability to laugh. I agree with Shelli about seeing red flags, but I have one deal breaker: religion. The man I marry must share the same beliefs as me. I think the idea of deal breakers goes back to simple preference and are uniquely part of who you are. I look at my ex and think, "Good God you are a discusting man." But someone thought he was dreamy enough to marry. I don't believe having deal breakers makes you too picky, but more selective and aware of who you are and what makes you happiest. Just watch out, if your deal breaker list is longer than your I want list, you might have a problem on your hands. 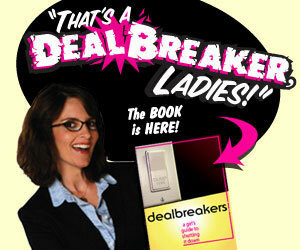 Everyone thinks they have deal breakers, but the thing is, everyone's deal breakers are subject to change. It depends on how much you really love the person. For example, my friend's husband said drinking coffee was a deal breaker, but my friend REALLY liked drinking coffee. At first, she did it behind his back, but then finally, she told him about it. He REALLY didn't like it, but it turns out it wasn't really a deal breaker, because he learned to live with it, and they are still together. Another friend's husband said that cheating on him would be a deal breaker. However, there was an infidelity on her part, and though it really hurt him, it didn't end up being a deal breaker for him either. He was able to forgive her, and they are also still together. Single deal breakers can be different than marital deal breakers and both are different than married with children deal breakers. :) But IMO, religion is huge in all three.